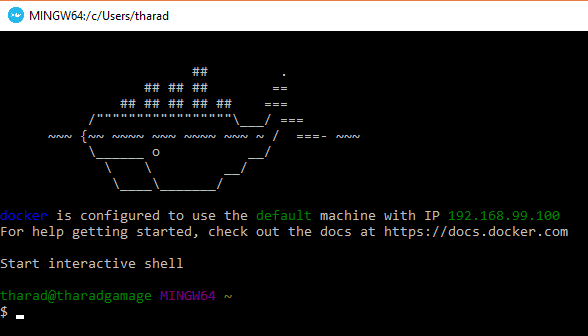 Docker on Windows is a little bit different than on Linux. Because Docker runs using features of the Linux operating system which not supported by Microsoft Windows. To run Docker on windows 10, Docker Toolbox will create a Linux virtual machine in VirtualBox and all containers will be created inside the virtual machine. In this tutorial we will learn How to Install Docker on Windows 10 using the Docker Toolbox. You can also use following guide to install docker for Windows 7 and Windows Server 2016. Go to following URL docker.com/toolbox and download the Docker Toolbox for Windows 10. After download is finished, run the setup file and install the docker toolbox with default options. From Windows 10 start menu launch the Docker Quickstart Terminal. The First time, it will run the initial configuration and will create the default virtual machine for the Docker Engine. Once it is done, you can manage docker from Windows using Quickstart Terminal, Windows CMD, or PowerShell. Note that Docker Engine is running inside a Virtual Machine also called as 'Docker Host' in Windows. If you open VirtualBox you will see a Virtual Machine called 'default'. We can manage the Virtual Machine with docker-machine command. To test Windows Docker Engine, let's run a simple hello-world container on docker. Docker will download the hello-world Docker Image and start a new container using the hello-world image. If successful you should see the "Hello from Docker" message as shown in the following image. This confirms that your Docker installation on Windows 10 / 7 / Server 2016 is successful.